A while ago, while wandering the aisles of Sam’s Club back when I had to drive two hours to get there and I took full advantage of looking at every.single.item, I spotted a little package of chocolate yumminess basically consisting of pretzels doused in caramel and chocolate with a sprinkling of sea salt. And I knew I had to try it. Admittedly, I’m a total sucker for anything dark chocolate packaged up in a little bag and marketed to seem specialty or gourmet. Those people know exactly who I am and how to get me to buy their stuff. This pretzel caramel concoction (to the commercial world, called Snappers) is insanely delicious. I literally had to force the bag into other willing hands in order to stop before the point of no return and ruin every workout I might (key word being might) undertake for the next six months. Of course, before handing off while devouring piece after piece, I had a lot of time for research and I realized that the ingredients + the cost = me totally making this one at a home. It’s so simple, it almost defies a recipe but here you go. Chocolate, pretzels, caramel, chocolate, sea salt. And most of those lovely ingredients are basically just dumped on each other in a very unfancy like manner. It’s salty and sweet and chewy and rich and totally amazing. I took my delicious, buttery classic caramel recipe, cut it down and adapted it for this recipe. Easy, peasy. This is definitely my new favorite holiday treat. I’m well aware of my weaknesses and this divine treat is right up there. The minute I made it, I packaged it up and gave it far, far away. For the last several years, I’ve done a fun and sweet Sugar Rush series. You can check out all the festive Sugar Rush recipes HERE – this list is filled with the best holiday baking recipes plus some gift-giving and packaging tips! I’ll be unofficially adding to it this month, as well as giving you some fabulous savory (and even a few healthy!) recipes for the holidays, too. For the caramel, in a medium heavy-bottomed saucepan, add the butter, salt, corn syrup, sugar and 1/2 cup cream. Set the pot over medium-low heat and gently melt the ingredients until the mixture is smooth and the butter is completely melted (don't rush this step by cranking up the heat). Increase the heat just slightly to bring the mixture to a simmer. Clip a candy thermometer to the side of the pot and simmer on medium-low (or whatever temperature needed to maintain at a simmer without burning) without stirring until the caramel reaches 236 degrees. Pour in the remaining 1/2 cup cream and again, without stirring, cook the mixture until it reaches 245-248 degrees on the candy thermometer. Off the heat, swirl in the vanilla. Let the caramel rest for 10-15 minutes before using. Meanwhile, line a large, rimmed baking sheet with parchment paper. Melt 8 ounces of the chocolate gently in the microwave or in a double boiler until smooth (don't overheat or it will seize or bloom, which is when it gets the white, grainy streaks throughout). Spread the chocolate evenly over the parchment. Before it sets while still wet, sprinkle about 8 ounces of the pretzel twists over the top. It's ok if the pretzel twists are overlapping a bit. Gently press them into the chocolate (the caramel will act as the glue that keeps everything together). Once the caramel has cooled just slightly, drizzle it across the top of all the pretzels. Sprinkle the remaining chocolate chips (or chopped baking chocolate, if using) over the warm caramel and let it sit until the chocolate melts (alternately, you can let the caramel harden and set and then melt the remaining chocolate and drizzle over the top). Once the chocolate has melted, spread lightly with a knife or thin metal spatula. Sprinkle with sea salt. Let rest until the chocolate on top has hardened. Tear or cut into pieces to give as gifts or to eat (be careful not to devour the entire batch!). I just made some today – looks pretty good, waiting for chocolate to harden. Couple questions, do you recommend “ salted” or “unsalted pretzels”? Also, was hoping to keep this at least for a week before allowing anyone to get into it – you said the pretzels will soften after 2 days, humbug! Would chilling it help keep it any better or just make it all too “hard”? Thanks for another great recipe. I always use salted pretzels. Refrigerating might work although I worry that the pretzels will soften once out of the fridge?? I made a double batch of this for teacher gifts, but my family loved it so much that I think I might need to think of something else for the teachers! Your fudge was also a hit, but this stole the show. Thanks for a great recipe! Here I am reading your yummy recipe while eating a Snappers! 🙂 I’m going to save this recipe for later. Thank you. I’d been trying to figure out how the Snappers people get the thick layer of chocolate on the bottom, thank you! Gonna make my own now! So I too am a Snapper addict, and I found your site when I was trying to find a DIY recipe, a bag of Snappers runs $5 and while I love them, that’s a bit expensive for a smallish size bag. Anyways, I really love the caramel recipe that you use, I have even made homemade caramels using just your recipe alone. Question for you, though, every other recipe I’ve seen for caramel separates the butter/cream mixture, heats that, and then pours that into the corn syrup/sugar mixture. Is there a reason you decided to do everything in one dish (not that I’m complaining, I love the convenience! ), just thought it was weird that many others that I’ve seen separate the two at the beginning. can i use store bought caramel syrup instead of making freash caramel?? Caramel syrup won’t have the consistency you need for this recipe. If you don’t want to make the caramel, you could try buying individually wrapped soft caramels, unwrapping, heating and using them instead but I haven’t tried it myself so you’ll have to experiment with how many to use. How much sea salt do you use? I don’t really measure – just sprinkle it lightly over the bark. First of all, thanks so much for all the awesome recipes and tutorials. I love your site. You are my go-to lady. 🙂 Secondly, I’ve made three (double) batches of these now and finally got it right the last time. I’m just wondering how you’d feel about putting a few notes in the recipe that would have saved me time and money. My first batch turned out yummy, but the chocolate did get white splotches. I melted chocolate chips on 50% power in the microwave. The second batch I melted in a double boiler but it still turned white. The caramel also got crunchy even though I thought I cooked it to the same temp. Finally on my third batch I calibrated my thermometer (I’d forgotten about the sea level thing) and tempered my chocolate. Maybe Ghirardelli chips can be melted how you suggest, but the Nestle Toll House chips I buy from Costco obviously cannot. Maybe you could do a post about using different types of chocolate, or just put the kind you use in the recipe (and a note about cooking candy at high altitudes for scatter-brains like me)? Thanks! Thanks for your detailed review and tips, Corinne! That will help those who want to make this recipe. I can’t always include variations based on everyone’s altitude and circumstances but it definitely helps to have comments like yours in the thread below the recipe so others can see what you’ve done to get it just right. Thank you! Mel, I made this last week. My caramel was seriously stick to your teeth chewy. Temp is calibrated, so that wasn’t the issue, so I just wanted to know if that’s how yours turns out? I decided to keep this batch instead of gifting it…and everyone is eating it anyway because it tastes so good. My one taste testing friend said she wouldn’t gift it, but she figured out how to eat it without it getting stuck in her teeth and could I please give her a big bag full lol! Anyway, just wanted to check to see if this is the texture it’s supposed to be or is yours a softer non-sticky chew? If so, I’ll work with a different temperature. Thanks for your help! Hey Ramona – yes, my caramel is pretty chewy, also, but not super sticky, if that makes sense. It’s kind of like the texture a caramel would be if you made a pan of caramels and rolled them up in wax paper. Others have commented their caramel was pretty soft, too, so maybe a higher temp would work better for those looking for a less sticky caramel, although too high and you may end up with toffee (which wouldn’t be a bad thing!). I’m glad you chimed in with your report – sorry it didn’t work out quite the way you wanted it to! I have made this three times and I still feel like I’m not succeeding at it. My caramel cools soooooo quickly that even if I pour it on the pretzels right after swirling in the vanilla, it firms up within seconds and I have to glop it out and spread it with a spatula. 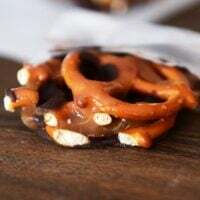 In looking at your picture, it looks like the caramel is thin enough to filter down among the pretzels. Mine is more of a solid sitting on top – which doesn’t work too well at gluing all the layers together. Any tips? Thanks! That’s a little strange that your caramel is cooling that fast, Meg. Any chance you might be cooking it too high of a temperature? It should be very hot and thick but very pourable – I’m able to drizzle it on so it leaks through the spaces in the pretzels and I don’t spread it out at all. Do you think your candy thermometer is pretty accurate? Hi Ann – it actually shouldn’t be printing with the picture – I”ll look into it and get it back to the way it was before (where pictures didn’t print). Thanks! Any idea how much this makes? I’d like to give it to teachers and wonder how many batches I’ll need…. Well, it somewhat fills up a full sheet pan (the large, rimmed kind). I guess it depends on how much you are giving each teacher but if I were giving this to my kids’ teachers, I’d probably portion it at least for 4-5 people (hope that doesn’t mean I’m being stingy!). Mel! You are not stingy! I made my 2nd and 3rd batches this evening. I got a very generous 6 gift baggies out of the 1st batch. They were about 5 ounces each — for those of you obsessed with a digital kitchen scale like I am! There was almost another 5 ounces left, but the pieces were really small, so I had to eat those! I might try cutting these next batches with a knife instead of breaking with my hands. The 3 I’ve given out have been very well received! Another winner! Thanks! Hi Mel, I’m not much of a candy-maker, but I was pleased with how my double recipe of caramel turned out. I got the first batch of chocolate melted, poured the caramel over my pretzels and it turned out great. Get the second batch of chocolate spread, go to pour the caramel over pretzels and it had started to firm up a bit. I got it spread ok with a knife. However, at this point it looked like the caramel was sitting in a bath of butter? Can you tell me why it started to separate? Thanks! I haven’t tried it yet but I am excited; it looks so good! I wondered if I used the flat pretzels if it would make a difference. I have an over abundance of those and thought I might try this. After I wioe the drool off my tablet. 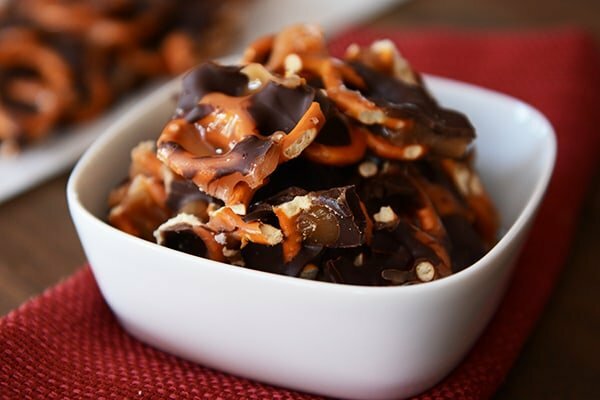 Other than the layering, is there a significant difference between this recipe and your Salted Chocolate Toffee Pretzel Bark? 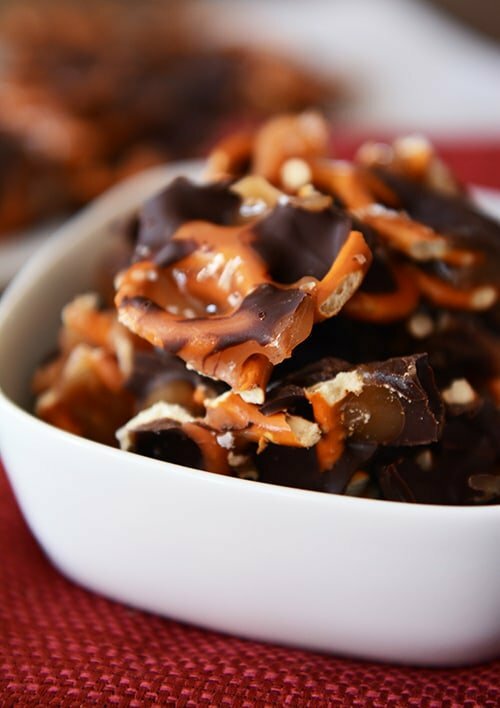 The caramel in this recipe is chewy – the toffee pretzel bark has more of a crunchy consistency. You’re correct in your warning that this treat should be a controlled substance. It has a pure, simple deliciousness that is wonderful! I used a good majority of a Trader Joe’s dark chocolate Pound Plus bar for this and it was lovely. I’m new to caramel and only had an instant read thermometer—plus was worried about burning it so only had the heat to 2.5 on my induction cooktop and it took a long time—but it was delicious! Curious about doubling it. Could I double the caramel to the same good effect? Glad you loved this, Susan! Yes, the caramel can easily be doubled. I made this yesterday and I too gave most of it away. I had too or I would have gained five more pounds. Another great recipe! Made this last night and it is gone! My dark chocolate hating kids gobbled them up. 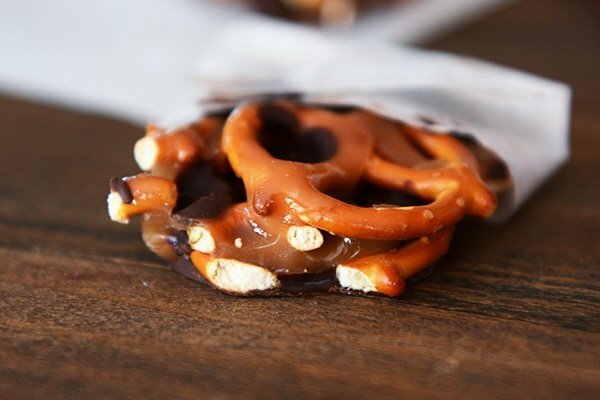 i have a silly question but I tend to overdo if I don’t ask…I just made caramel the other day and think I could reheat and use some of it to make this; but I’m wondering if you have an approximation of how much caramel your recipe makes so that I don’t end up drizzling way too much over the pretzels? I’d hate to use 2 cups if your recipe makes only like 1/2 cup…see what I mean? thanks! Right around 2 1/2 cups Beth – maybe 2 3/4 cups. thanks for getting back to me; I cant wait to make them.. I tried the one that went around last yr where you put the caramel on the pretzel and heat them and then dollop w/ chocolate and felt like I was going to lose a filling; this makes much more sense. anyway, wanted to also mention how much I like your blog; I’ve tried quite of few of your recipes and have enjoyed them all. the time you put in is very appreciated. I ask because I’d like to ship this overseas to my military husband and I’m wondering which would hold up better. Good question! The old recipe is more like toffee…the caramel part is buttery and crunchy whereas this one the caramel layer should be smooth and chewier. The older recipe will probably hold up better in the mail. Mel ~ Silly question…do you use half and half or heavy cream or does it matter? Hey Jennifer, yep, it does matter. I use heavy whipping cream. The caramel will be much thinner with half and half. And if you want to mix things up again, add some peanut butter. Amazing. Got the idea from Take 5 candy bars. Thanks Mel, now I have a reason to keep running through the winter. The 10-minute caramel sauce won’t set up like this candy needs, I’m afraid. Sorry! I am not sure I believe you on the day or two rule to eat these… I think you should send be some in the mail… you know just so I can be sure :). Ha! April, you are a smart lady. I wish I was closer to unload all my goodies on you guys. Made these for pack meeting tonight… perhaps this is too good of a treat for the boys.. They won’t appreciate it as much as the mom’s will! Wow! These look so good! When you add the cream in step 3, do you stir it in at all? Nope, I just drizzle it in and let the caramel continue to cook without stirring. Made this last night and while it is very tasty, the caramel is a little on the hard side. I followed your directions precisely and I know my thermometer runs a little low and still the caramel is not as soft as I would have liked. Would it be better if I took it off before it hits 245*? Maybe 243* or 244*? Hi Kelly – yep, sounds like you might want to undercook the caramel by a few degrees, maybe even to 240. Your creative, original recipes are ALWAYS the very best — most are our favorites. Having said this . . . groan, did you have to post this oh so tempting recipe when “running season” is over in my part of the country?? Thank you for all your hard work and the wonderful tutorials that are so helpful. you’re killing me with this! Gulp! This is going to happen soon and totally perfect for Christmas gifts from the kitchen. I just made this and I have a question. My caramel is runny, like syrup. Is that right? Will it harden? If the caramel was cooked to 245/248 it should set up nice and chewy once it cools over the pretzels. Did it darken to a golden brown color while cooking? My temp was right, but it was still light in color. It did not set at all. 🙁 I’ll have to give it another go because even though it didn’t set it still tasted good. Shoot, Amanda. Any chance your thermometer might be off? If it was light in color it sounds like it didn’t cook long enough. Mine is taking a looooong time to cook. I’ve been watching it for over an hour now, but it’s looking great. That low simmer just takes time/patience. LOVE these! They look and sound amazing. Totally would have bought them as well, I’m all for chocolate and cute packaging! Oh boy. I tried these from Costco, and I bet your homemade version is even more delicious and addicting. I might be in trouble! Mel, my husband doesn’t like dark chocolate can I use milk chocolate for this instead. Thanks. Certainly worth a try if you prefer milk chocolate but it will definitely make the overall candy much, much sweeter. Hi Aubri – I almost always use the Ghirardelli brand of bittersweet or semisweet baking chips (they melt really well unlike other brands I’ve tried). I can’t say I am a huge fan of dark chocolate. I know I would lose some of it’s charm but I would like to make this with milk chocolate. Would anything change in the recipe if I make this switch? Thanks! Certainly worth a try, Lisa, if you prefer milk chocolate but it will definitely make the overall candy much, much sweeter. Sweet and salty snacks are my kryptonite and these look addictive! They are soooo going to happen in my kitchen. Yum! I think I just found what gift I’ll be giving to my kids’ teachers! Like someone above posted- do you know how long this lasts? Thanks! Mel! I was just in Costco this weekend and saw the very snack you’re talking about! I picked it up, showed my husband how good it looked, and put it back on the shelf (!) For the past couple of days, I’ve been deciding whether or not to make my own version. And here you are, on it already. Looks great! Looks yummy…in the photos it appears as though you have sprinkled some chips over the caramel layer prior to the last step with melted chocolate drizzle…do I need additional chips for this step? Hi Patti – sorry about that. I just wrote the instructions up a little differently (I made it a couple of times and didn’t include the easiest method). I’ve fixed it – but basically I just sprinkle the remaining chocolate (unmelted) over the warm caramel and let it melt before spreading. But if the caramel has already cooled, you could definitely just melt the remaining chocolate and drizzle it over the top (there should be about 4 ounces left for the top, whether you melt it or sprinkle it on unmelted). Have you ever had this around long enough to see how long the pretzels last before getting soggy? Maybe you eat it too fast to find out???!!! Jess (and Michelle) – if it’s well-covered, it lasts for a day or two. Beyond that, the pretzels do soften up a bit. The sweet-salty combination in this bark is just perfect! I can’t resist anything with dark chocolate, especially if it’s also filled with caramel sauce! It certainly looks delicious Mel! I’m all for dark chocolate, caramel and pretzels. That combo together makes me faint. Hope you had a wonderful Thanksgiving with the family! I’m all over these! Totally my kind of snack!